At the top of a steep staircase in crowded Santacruz East is a room with the nameplate ‘CHAMAR COLLABORATOR’ nailed to its door. Sudheer Rajbhar and Sachin Sakhre, surrounded by sheets of black rubber and a framed poster of Dr. Ambedkar looking over them, are busy at work as I make myself comfortable in a corner. I met Sudheer last year at an impressive exhibition he had curated at Clark House Initiative. The show consisted of original works made by assistants of well-known Indian artists, and pushed the viewer, perhaps even uncomfortably so, to think critically about the Indian art scene and the way it uses (and abuses) its labour force. Earlier this year, Sudheer launched ‘Chamar Studio’, with Sachin as his collaborator. Chamar Studio is a boutique brand that specialises in making stylish bags out of recycled rubber tyres. In a relatively short span of time, it has piqued the interest of many, owing both to the minimalist style of its first collection ‘Bombay Black’, as well as its daring and unabashed use of the term ‘Chamar’, originally a caste-based name referring to leather workers, often used by upper castes as a slur. The term ‘chamar’ has mostly been used to humiliate someone. In fact, according to the Supreme Court, using the term could amount to a punishable act. What led you to name your brand ‘Chamar Studio’? Sudheer: I was brought up in Kandivali, here in Mumbai. I belong to the ‘Bhar’ caste. When I would visit my ancestral village as a child, I noticed that the Bhar and Chamar living areas were quite separate from the rest of the village. Both castes were treated like untouchables. Both ‘Bhar’ and ‘Chamar’ were often used as swear words, and people seemed to have the impression that our communities are lazy, and only know how to clean drains or skin dead animals. I never understood this. Why does someone have the right to humiliate you just because of the work that you do? It was this question that led to me creating bags under the label ‘Chamar Studio’. I didn’t think about it too much in the beginning, it was just one of my art projects. But as I spent more time in places like Dharavi, where leather workers were virtually out of jobs because of the beef ban, I realised that the brand might have the ability to benefit many people, both financially as well as in changing the perception of their community. It’s an interesting space you’re occupying, because you’re attempting to twist an identity previously associated with shame to that of pride. Sudheer: As a brand, we’re not interested in simply parading around the fact that we are Dalit. We want to represent our work with pride and respect. There is nothing wrong or impure about the work our communities have been doing for centuries. In fact, we are highly skilled in what we do. The real question is about the label of untouchability associated with it. If you’re carrying a bag that clearly has the words ‘chamar’ written on it, you’re bound to question yourself about your own caste privilege, and think more deeply about who made this product for you. What are some of the responses people have had towards the bags? This shows that people are trying to understand, trying to interact with the word. More conversations like this should be happening. Journalists who have approached us too have taken a bit of time to understand how we are reclaiming the word. Unfortunately, many of these reactions have always started with a bit of fear or suspicion, but on continuing the conversation, people start to understand our intention. We have now begun attaching labels saying ‘Chamar’ to all our bags, in Hindi, Urdu, and English. We might even extend this further and add the names of the artisans who have stitched them. In the end, this is their work, and they should, we should, as a brand, be proud of what we have created. How many people work with Chamar Studio? Sudheer: We’re a team of eight artisans right now. My first collaborator was Sachin, and he’s a vital part of the studio. The rest comprise members from the leather working community in Dharavi. We’re constantly trying to get more people involved. Chamar Studio is not limited to one community or one place. In Mumbai, we are now starting collaborations with cobblers who sit on railway platforms, but we hope to extend operations to Kolkata, Gujarat and Bangalore. Sachin, what’s your relationship with the brand like? Sachin: Sudheer and I have known each other for five years now. In fact, we worked together on some other art projects of his before this. Sudheer: When I was creating a body of work around objects collected after slum demolitions, I began to use black rubber to push my practice some more. Sachin would help me with this material, and so when I started Chamar Studio, it was impossible to think of it without him. Sachin: I’ve been working as a cobbler since I was in the 8th standard, when my father had an accident and couldn’t continue any more. My shop was outside Sudheer’s building, and we ended up spending a lot of time together, working on this or that. Today, Chamar Studio is my primary work, but I’m also a supervisor for sweepers with the BMC. I’m getting some of the sweepers to work with us too. They’ve seen me in the papers, and they feel excited to be a part of this venture. The community will then grow. Why is it so important to you that the community grows? Sachin: I want more people to see that there is artistry and craftsmanship in their work. Just as it takes a long time to develop an art form, I have spent years mastering stitching. I used to sit at the footpath and fix people’s broken chappals, and I had no idea I was an artist. Now I feel proud of what I do. I want more people to feel this way about themselves. Your collection ‘Bombay Black’ has a particularly clean design. How did it come about? Sudheer: Since some of my previous artworks involved this black rubber material, I was excited about the possibilities of creating a product with it. I had a basic design for a small bag, cut the materials, and handed it to Sachin to stitch however he felt fit. I can’t stitch, and I don’t want to learn either, because Sachin has an expertise over it that I will never be able to achieve. Sachin: It took a while at first, but now I can make a bag from start to finish. I mainly focus on the measurements of the rubber though, and then we hand the cuts over to other artisans to stitch it into bags. Sudheer: We have a range of bags now. Each is unique in form, and we've given them names that are commonly used in Mumbai. In the Bombay Black collection, we have the Batwa, meant to be held in your hand; Jhola, slung over your shoulder; Karyalaya, a more formal-looking bag; Basta, that can be worn like a rucksack over both shoulders; the Chamar Thela, a cloth bag with 'chamar' written across in various languages, and Patta Khisa, which comes with an adjustable belt, allowing one to wear it as a fanny pack, over your shoulder, or even as a hand bag. Is there a particular reason why you’re positioned as a high end brand? Sudheer: Our products aren’t necessarily cheap, and we’ve deliberately done that to make sure our artisans get a fair price, not a measly sum of 200 rupees or so for a whole day’s work. We’re also in the process of making our accounts accessible publicly on our website, so potential buyers will know exactly how much the material costs, and how much we pay each member of Chamar Studio. Where can one buy your products? Why can’t one easily buy them online? Sudheer: Le Mill is one of the first stores we started selling our products at. There’s also Paper Boat Collective in Goa, and we’ll be at the Kochi Biennale too. There are also a few stores in Europe that we’ve begun supplying to. We haven’t mentioned any prices on our website. That’s a deliberate decision on my part, because I want those interested to make a bit of an effort. One can write to us for the price list and we’ll send it promptly, but this is what makes it interesting, and more than just a fashion brand. People should talk about it a little, spend some time thinking about why they want to buy a bag from us, and recognise the work that’s gone into making it. We value customers who are able to enjoy this process, not just those who wish to buy off the rack without thinking twice about who made it. You mentioned you wanted to expand to other cities. Sudheer: I want to expand the idea of Chamar Studio itself, and start the Chamar Foundation. It’s a big project, and since it’s impossible to find space in Mumbai, we’re going to set it up in Bangalore. The foundation will support art and craft, with no restriction on membership. I don’t want to focus simply on contemporary artists. We’ll be hiring a part of it out on Airbnb in order to run the place, and the rest of the area will be a gallery and library. I want to foster an environment that encourages people to talk to one another, and hopefully collaborate. We’ll be inviting a hundred artists and designers to interact with our bags. They can do what they like with them, and once they return them, we’ll be auctioning them to raise money for the foundation. We’ll also make a book documenting this, and include all the artists and artisans who contributed to the project. Is there a fundamental difference between an artist and artisan? Sudheer: An artisan will always have the capacity to become an artist, but an artist can never become an artisan. He wouldn’t want to either, not in our art scene. Unfortunately an artisan is seen as one of lower status, with less pay, and no fame in sight. What many don’t recognize is that an artist may be responsible for the idea, but an artisan is the one who carries it out both technically and aesthetically. Without artisans, the Indian art, design, and fashion world would topple. Visit the Chamar Studio website and follow them on instagram. Rajyashri Goody is a mixed media artist based in Pune. She likes food, Dalit literature, and constantly stressing about making her mum proud. Visit her website and follow her on instagram at @rajgoody. Regional Indian cuisine gives the exotic a run for its money. Binge presents an eater's guide to finding the former in the capital. The Bhuli girls teach us about northern state's cuisine beyond maggi and momos. We met with the Hyderabad-based photographer who sculpts her subjects at the Kochi Muziris Biennale. We get comfortable at Home Sweet Home's Kochi exhibition and discuss the curious case of Bangalore's apartment galleries. A Q and A with artist and designer Gunjan Gupta on her show Kissa Kursi Ka at the Kochi Muziris Biennale. An interview with Heems about the latest release from their album Cashmere. This two part podcast episode by food journalist Amrita Gupta answers the all important questions: where are oysters found in India and why aren’t we eating them? A dose of art, poetry, music and interesting links on the Internet with every issue. Typography-based posters of easy desserts made with locally sourced ingredients. Mansi Gupta, designer and founder of leather goods label TRMTAB on small changes. Coinciding with the London Design Festival this week, Indian Design Platform presents Transformation, an exhibition of objects and installations by contemporary Indian designers whose practises give a second lease of life to unwanted materials. We interviewed Nitin Barchha, co-founder and designer at Mumbai-based design studio Material Immaterial whose papier mâché lamps will be on exhibition. Who makes up Material Immaterial? How did you begin to work with each other? The Material Immaterial studio was founded by myself and my partner Disney Davis. We met while working together as architects in a studio and then founded our own architectural design practice 'The White Room Studio'. The main motive behind establishing Material Immaterial was to create work that could offer the end user spatial experiences and get them closer to nature through small objects of daily use. The studio aims to go beyond a definitive material or definitive process and aims to focus purely on ideas, limiting the material to be a mere medium of expression. The studio is built on the basic principles of exploring the bare beauty of materials. As designers we are essentially minimalists and our design approach has always been of what to leave out, rather than what to put in. This reduction process is what takes one through a mirror, emerging out on the other side to discover richness, like in the subtle differences between five shades of grey or in different textures of concrete. Through our work the studio strives to challenge the purpose of material and lets design be at the helm of things. What are you exhibiting at Transformation? The Bell Flower Cloud lamp is ceiling mounted with clusters of bell flowers drooping down, they incorporate the texture the buoyancy and the feeling of lightness. The Mushroom lamp is inspired by a real mushroom taking form and its intricate texture replicating gills with its stalk. The light is hidden, and only the glow visible once the lamp is fixed onto a wall. 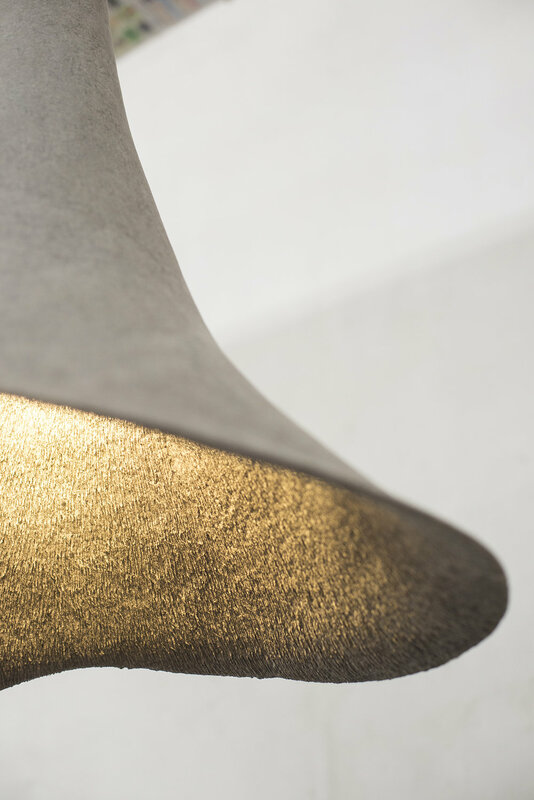 The Trumpet lamp is inspired from the flower Angel's Trumpets. It is suspended from the ceiling and has mirrors inside which reflect and focus the light downwards. The texture on the outer surface is smooth and the texture inside is made rough. For the Organic collection they came from nature, be it mushrooms, mosses, ferns or flowers. The products are made from recycled newspapers which is then ground into a pulp mixed with glue and converted into papier mâché. What led you to work with papier mâché? The Organic collection is the first product line from our studio. We used papier mâché as it gives us the flexibility of use and allows us to explore different possibilities of form and texture inspired from nature. We wanted a material that was lightweight, flexible (so that we could create organic forms) and is inexpensive (raw material). We started experimenting with paper in different forms and eventually landed at papier mâché. This was the only material that had all the qualities that I required and was also easily available. The first experiment using papier mâché was a pen stand that still stands at my studio. Slowly over time, we perfected the techniques required trying various permutations and combinations. After about two years of continuous experimentation, the resulting papier mâché was exactly what we were looking for. Name three local designers to keep an eye out for? Good design is minimal, aesthetic & forever. Photography by LOVER studio for Create Culture. Transformation is the second edition of Indian Design Platform, an exhibition by Create Culture at The Guardian Gallery, London between 19th and 25th September. More details here. circumstance — death or disaster. or I fall in love with another man. that we will lose each other to something. and the dogs on the beach are howling? Visit The Alipore Post Offline, a curated weekend pop up in Bangalore this weekend Sept 17th and 18th at The Courtyard House. For a daily dose of art, poetry, music and interesting links found on the Internet, sign up for The Alipore Post. The Australian artist who collected garbage from the streets and then put it right back.